The 2017 Governor's Award for School Health and Wellness was awarded to Manitou Springs School District 14 today at the Colorado Healthy Schools Summit. 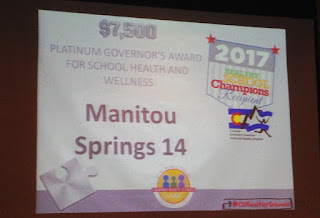 Colorado Department of Education Commissioner of Education, Dr. Katy Anthes, Colorado Department of Public Health Executive Director and Chief Medical Officer, Dr. Larry Wolk and Colorado Governor's Council for Active and Healthy Lifestyles appointee, Dana Wood, presented the award. A total of 46 schools were recognized for their efforts to address comprehensive school health and wellness as part of the Healthy School Champions Recognition program, a collaboration between the Colorado Education Initiative, Colorado Department of Education, Colorado Department of Public Health and Environment, Governor's Council for Active and Healthy Lifestyles, and supported through funding from the Colorado Health Foundation. For more information please visit the Colorado Education Initiative website.